On a soft spring night in Mexico City, drawn toward the city’s immense main square, the Zócalo, I happen on a free concert by the Cuban troubadour Silvio Rodriguez. Tens of thousands have jammed into a temporary corral, singing along to mid-century anthems like “Ojalá” and “Unicornio” beneath the darkened windows of the presidential palace. Behind the stage, the cathedral towers glow indigo, then magenta, then gold. Riot cops lean casually against a department-store window, their helmets, clubs, and plastic shields piled on the sidewalk. Several decades ago, Rodriguez’s lyrics entered the canon of Latin America’s left and his soft, downy voice was the sound of revolution. Now the atmosphere is mellow and almost prim. At least at the fringes of the crowd, nobody is drinking or smoking pot. Welcome to the seat of the Aztec empire, the heart of New Spain, and, until a dozen years ago, the bull’s-eye of a bleakly damaged historic urban core. 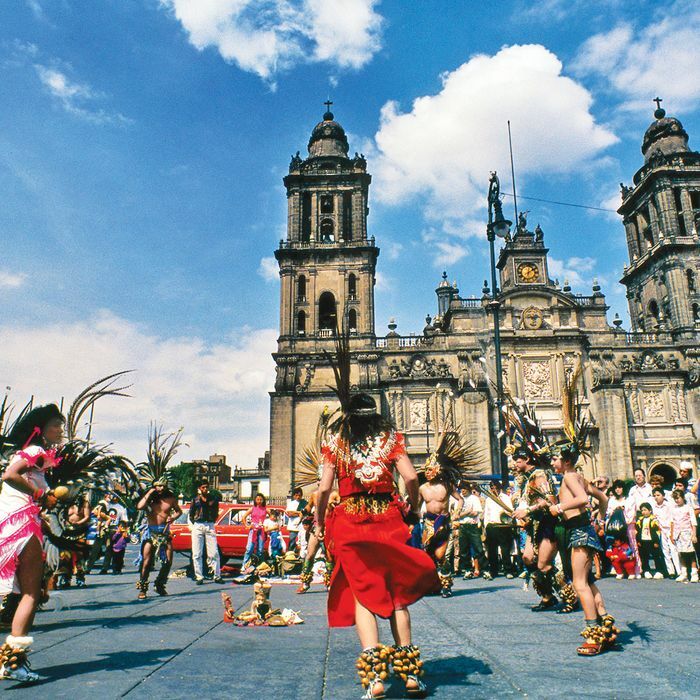 Today, the neighborhood overflows with pleasantness and the Zócalo is a regular venue for free concerts, televised soccer matches, book fairs, and protests. Michael Bloomberg should see this, I think. When New York’s mayor left office at the end of last year, he took a conclave of top consiglieri, including his planning chief Amanda Burden, streets guru Janette ­Sadik-Khan, and cultural-affairs commissioner Kate Levin, to form Bloomberg Associates, a consulting outfit that will carry the New York way of urbanism to cities around the globe and provide its services free of charge. Now I understand what Sadik-Khan told me at the end of her tenure when I asked her what she’d be doing next: “The same thing, only globally.” Bloomberg Associates has been discreet—secretive, actually—about its plans, but in February the mayor of Mexico City put out a press release announcing that his administration would be the group’s first client. It hasn’t made much of a splash there. Bloomberg is not the first ex-mayor of New York to come bearing solutions. In 2003, Rudy Giuliani swooped in to look around, collected a $4.3 million fee paid by the telecom billionaire Carlos Slim Helú, and sent in a crime-stopper report that more than a decade later still gets giggles in Mexico City. (His suggestion that the notoriously corrupt police crack down on squeegee men, street hawkers, and freelance parking-lot “attendants” seemed particularly out of touch.) Still, a city that was once considered menacing, filthy, and ungovernable is now merely exciting. In many ways, it resembles the city that Bloomberg took over from Giuliani in 2002. The population is 9 million and growing (21 million if you count the greater metropolitan area); crime is ebbing but remains a serious problem; the air is clearer than it used to be, but my weather app still sometimes predicts “smoke.” Mexico City suffered a cataclysm even more traumatic than New York’s, in the form of a 1985 earthquake that shattered thousands of buildings. Since then, rebuilding and gentrification have reshaped the city’s mental map. But at the center of the megalopolis is an area that has out-Bloomberged Bloomberg. Much of it is virtually the private fiefdom of his fellow plutocrat Slim, who, rather than running for mayor himself, has persuaded a series of politicians to help him remake Mexico City in his image. In the past dozen years, he has transformed himself into a kind of imperial developer and erected glass condos, revived crumbling palaces, created new business districts, built a museum, and expanded the wealthy Polanco district. “He’s trying to turn Mexico City into something out of Fritz Lang’s Metropolis,” grumbles Victor Delgadillo, an urbanist at the Universidad Autónoma de Ciudad de México. The centro histórico had already been crumbling for decades when the 1985 earthquake brutalized Mexico City. Depopulated and dangerous, it contained a scattering of run-down museums and government offices—and a daytime throng of sidewalk vendors who spilled into the street and made driving through it an extreme sport. Now the wedge west of the Zócalo is transformed. Tourism is up, and the streets no longer go dead after dark. Baroque palaces have regained their patina of charm, courtyards their sense of serenity. Once-vacant apartment buildings are filling up again, and announcing at a dinner party that you live in the centro no longer gets you expressions of puzzlement or pity. Urban innovations like bike lanes, pedicabs, and bus rapid transit have begun to flow out from the oldest sector into the rest of the megalopolis. On Sundays, when cars are banned from the wide Paseo de la Reforma, flocks of gaily spandexed cyclists descend on the historic core. All this upgrading has not (yet, anyway) unleashed a localized geyser of gentrification, partly because so many buildings are at least nominally vacant. Delgadillo has no love for neoliberal urbanism—reshaping a city through private investment—but he says that displacement, if you can call it that, has been limited to longtime residents who bought the apartments they lived in at subsidized prices and are now cashing out. Besides, gentrification has a different geography. Mexico City’s wealthy follow their own automotive orbits, from guarded enclaves to shiny office parks, with perhaps a long lunch break in the country-club-like patio of the Restaurante San Ángel Inn. Closer to the center, the tranquil and verdant neighborhood of Condesa, which used to be a slightly shabby bohemian neighborhood, is now increasingly glossy. Its once run-down Art Deco buildings have been brought back to a state of tasteful outlandishness. When I visited, violet jacaranda blossoms canopied the streets and studded the sidewalks, and designer dogs dashed through the pools of Parque México. But areas like that are slivers on a sprawling map. Mexico City’s scattering of little towns has been connected by an undulating ground cover of cinderblock houses, many homemade and raw, their façades painted in brilliant blocks of color. Even the historic center is largely unbeautified terrain. A few blocks north of the cathedral, beneath a continuous arcade of plastic awnings, is the Giuliani-­proof barrio of Tepito, where squatters occupy windowless ruins, young men charge through crowds pushing hand trucks piled high with bales and boxes, and vendors hawk made-in-China trinkets and knockoffs with labels advertising misspelled brands: Kelvin Cline, Channel, Samung. Bloomberg, like Giuliani before him, might fantasize for a moment about cleaning up the chaos and running a bike lane through a rowdy slum, but that would mean ripping, Robert Moses style, through a dense social fabric. Instead, he ought to study what’s already been accomplished: the miraculous resurrection and gradual repopulation of a troubled downtown. Team Bloomberg goes to Mexico City bearing examples from Brooklyn, but it may return full of suggestions for St. Louis, Cleveland, and Detroit.